The Sunninghill Indoor Arena has an excellent well maintained sawdust and sand mixed surface with sprinkler system, good airflow, lights and PA system, large mirrors, and a spectators viewing gallery. The arena is suitable for both flatwork and jumping and is available for hire by the hour for individuals or by the day for shows and clinics. The Sunninghill Outdoor arena has a river sand and yellow sand mixed surface and can be used as a warm up area for the indoor arena or for flatwork and jumping and has floodlighting for night riding. The arena can be hired by the hour for individuals or by the day for groups and events. Hire rate: Arena hire for events is $200 per day (plus ground fees). Arena hire for a single horse is $20 per hour. The Sunninghill Round Yard is safe, well-constructed and completely under cover so you can work in shade in summer or out of the rain in winter. It has rubber around the base, lights for working early or late, and a sprinkler system to dampen dust. Adjacent to the Indoor Arena is the Upper Stable block and Recreation Area. The Recreation Area is ideal for both functions and clinics. For functions, or just for a break between events, there is an area set out with tables and benches for relaxing and eating. It is equipped with BBQ facilities, fridge, bar area, and tea and coffee facilities. There is space suitable for lectures and hands on clinics with podium and whiteboards all within the stable block area so that horses can be within easy access for hands on demonstrations and learning. 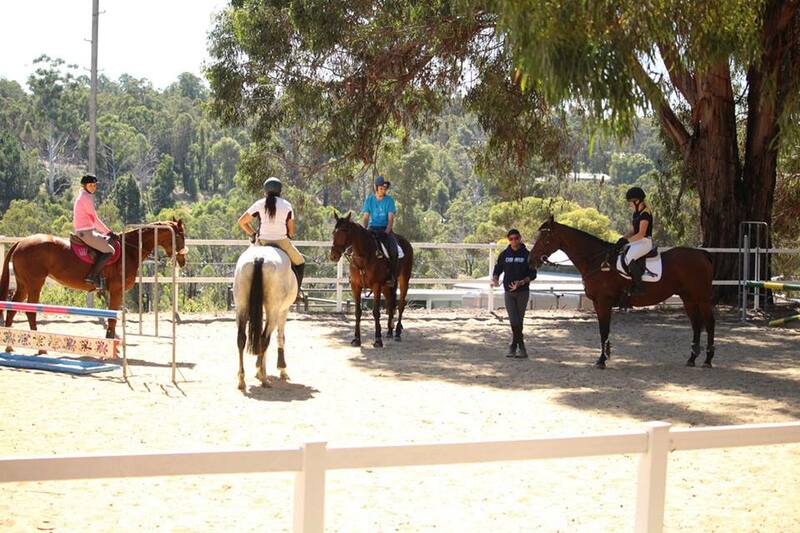 (Sunninghill can also provide safe horses for use for demonstrations.) Light refreshments can also be arranged for lunches or morning and afternoon teas, or a sausage sizzle at the end of your event. The entire area is under cover with a concrete floor. The breezeway is open at both the stable and recreation ends of the building. This allows good airflow, though can be a little breezy and/or cold in the cooler months. For your comfort, in hot weather, the area is able to be cooled by our large outdoor air conditioning unit. During the cooler months we can provide large area gas heaters for your use for the cost of the gas cylinders. 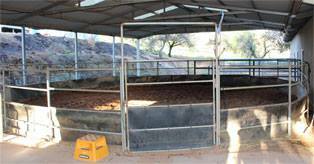 Sunninghill has a safe, well designed, solid metal Vet Crush available for hire (fixed on site) by vets or those needing a Vet visit but lacking the facilities on their own property. Stockfeed is available at competitive prices on site. Tea and coffee facilities, Fridge, BBQ, Bar and Entertainment Area for group gatherings. Review - Horses, riders and spectators were very grateful to have access to the much improved facilities at Sunninghill over the duration of the four days of our event and I would like to take this opportunity to thank Mike and his team for their support, interest and ability to assist with any request, even at short notice.